The city of Caesarea was constructed under Herod and named after the Roman Emperor, Caesar. We continue driving north passing through Haifa where we stop to see the breathtaking Bahai Shrine and gardens. On our return journey, south we stop at Acre (Acco), the largest Crusader city in the country. The city is extremely well preserved and you cannot help being impressed by the incredible architecture and how it has survived. Part of the city is alive with markets and people still living in the ancient buildings. 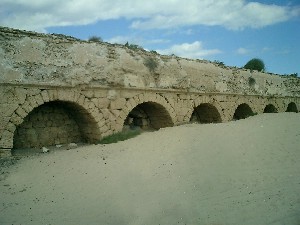 We see the walls and moat which was reconstructed and repaired by El Jazzar at the end of the 1900s. The mighty walls prevented even Napoleon conquering the city. We can see the Crusader remains, the prison used under Turkish rule and the gallows which were later used under the British Mandate to hang Jews who broke the British law limiting Jewish immigration to Palestine following World War II.